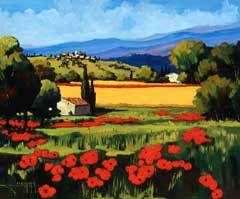 Joanny, an artist of international acclaim, is well recognized for his paintings of the Provence region in Southern France. It is not by accident that he chose to live and raise his family in this area. 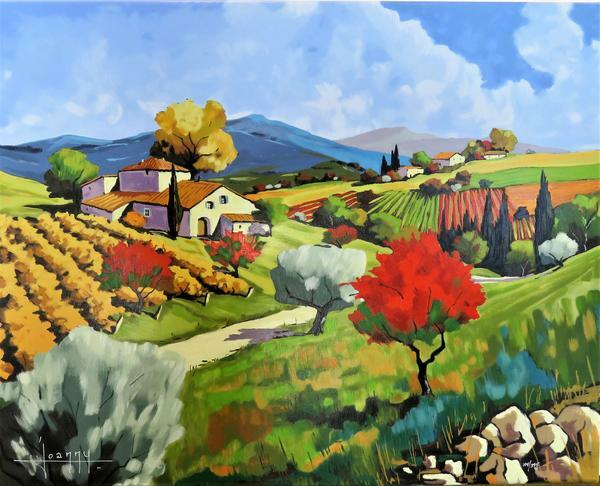 The lure is the sun soaked landscape that creates colors so vibrant and surreal that it drew such great artists as Van Gogh, atisse, Cezanne and Gauguin. Joanny steps out of his front door and the world around him becomes a painting waiting to unfold. 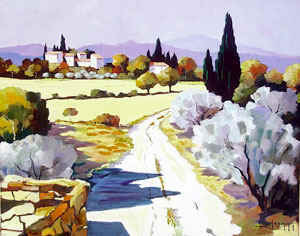 Through his paintings we can experience the lavender fields of Vacluse, the sunflower fields on the road to the village of Gordes, the poppy fields of Provence in spring, the regal beauty of the olive and cypress trees and the inviting roads which lead to small farmhouses in the country or to the deep blue-green of the Mediterranean Sea. Joanny, (Jean Tierant), was born in Paris in 1931. His father was a master calligrapher and his mother worked as an architectural designer. These rich creative influences instilled in Joanny an passion and talent for drawing. In his early teens he headed off to the stimulating environment of the Montmarte area of Paris. He spent long afternoons in the studios of artists and friends where he was able to study their techniques. 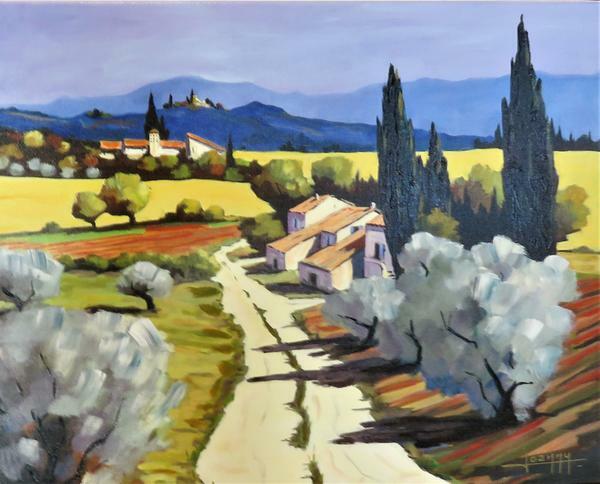 They gave him brushes and canvases to use and encouraged him in his career. These mentors recognized the talent in one so young and were thrilled when he sold his first painting. But the money didn’t come in fast enough after Joanny met and married the love of his life, Roseline. With two small children and a wife, Joanny set aside painting for the security of a career in sales. 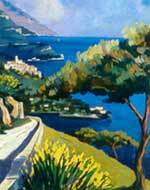 It wasn’t until many years later thet he would be able to return to painting. 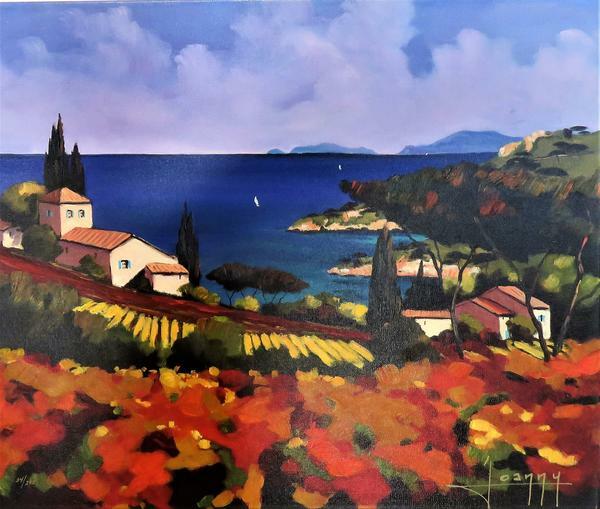 As he paints to capture the colors of Provence, he relies on the contrast between the vibrant warm colors of the sun exposed landscape and the cool transition of shadow. The waters of the Mediterraneon beckon with the deep blues and teals that reflect the mood of the sky and the depth of the sea. 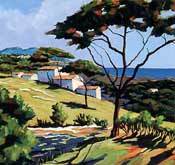 He captures the very essence of the beauty of the South of France.